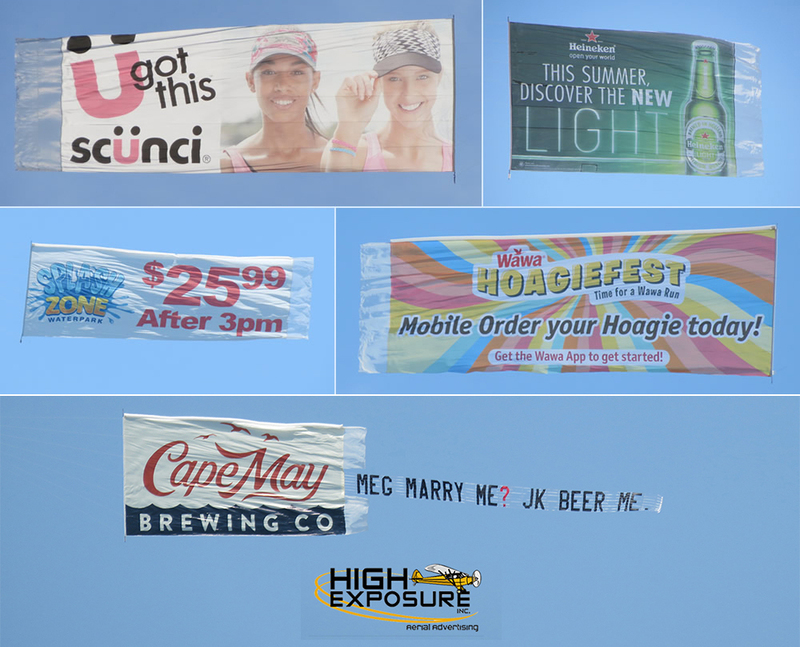 High Exposure will design and print custom aerial billboards to your exact specifications and provide you with a proof. We fly them over any market you choose using our high-end fleet of banner towing airplanes. Your custom aerial billboards can be flown over beaches, sporting events, cruise ships, lake shores, parades, state fairs, golf courses, rush hour traffic – and we only fly in good weather! Target your audience with messages that grab their attention without distractions! High Exposure can handle national aerial advertising campaigns as well as providing targeted service to smaller, local markets. We provide the expertise through every step, including design of the banners, selection of logos, artwork for the banners and providing you stats on the best sites to fly based on weather conditions. Reach millions of impressions over packed beaches, sold out sporting events, NASCAR, NFL, MLB, AND MORE! !